We all know how important branding is to packaging. A solid logo sets a tone for your brand, sending a visual message that no fine print can top. More than that, it’s the cornerstone or becoming an icon. Where would McDonald’s be without those famous arches? Think of all the shirts you see with the Coors Lite emblem, or John Deere, or the endless string of car company symbology you find on apparel. Corporate logos on clothing, people. We are paying to be walking billboards! I’m not mad about it. Most of my t-shirts have some kind of brand or symbol as the main focus. Lots of Star Wars title cards. The Autobot symbol. The Bacardi bat. If I love something–or, at least, really really like it–I want to rep it. Show it off. Maybe the company feels like they own me when I do this, but in a way, I feel like I own a little bit of them. More than that, I’m fascinated by logo design. The hidden messages, the smooth lines, the blending of words and images to create a clever visual pun. 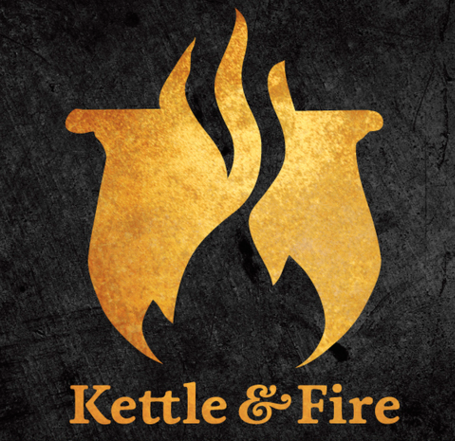 Check out this cool retooling of the Kettle & Fire bone broth packaging. If I was a bigger bone broth fanatic, I’d consider it totally tattoo-worthy. So is all of this cross-brand-representing the ultimate marketing strategy? Or is it dumb luck? Maybe a little bit of both. The concept of a logo can be traced back to prehistory. Seems mankind has always needed to differentiate and stand out with symbols. Perhaps more so, in times without language. Royal coat-of-arms could be considered the first sort of trademark. But the actual word is an abbreviation of logotype, a hot metal typeset made for early branding. Simple identifying words that grew into an industry in its own right. Nowadays, the idea of starting a business without a logo seems preposterous. What would you put on your letterhead? On your storefront? Your business cards? Your packaging? Who would you be without a logo? There’s a lot of identity contained in a logo. From the design choices, to the name you pick, down to the font you use. Maybe more than any other facet of a business, the logo speaks volumes. So maybe it’s no surprise that we as a culture are so drawn to brands. There’s a passion in it. A glimpse into the hopeful desire that started it all. The moral of this story? Take care of your symbol. It might make you famous someday.